Accused of cheating in college? Top 3 tips from an attorney for students. Students who are accused of cheating in college may feel pressured to try and resolve the issue quickly. 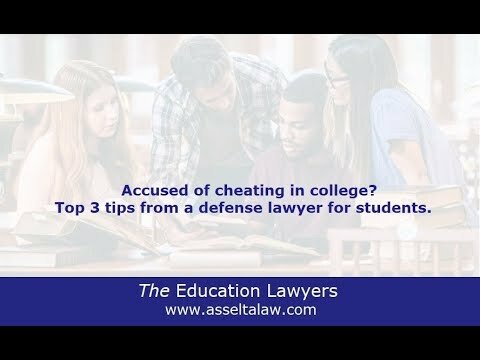 Before doing that, read a defense attorney for students top 3 tips if you are accused of cheating. Be careful about what you say or write to university staff - Think before you speak. Does your defense make sense, is there any other information you should use to support your position. Read your student handbook - Look for the honor code of academic integrity section. This will outline the process you may face if a professor thinks you cheated. The university is not always your friend - anything you say or write in an attempt to make the situation go away may be used against you in an academic committee hearing.